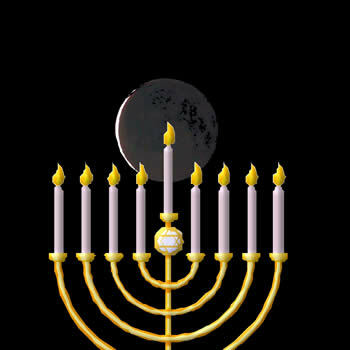 The Greeks made three decrees against the Jews: the brit (circumcision), Shabbat observance, and the New Moon. Why did the Greeks make a decree against the New Moon? The ancient Greeks made three decrees against the Jews. They forbade the brit (circumcision), Shabbat observance, and the New Moon. By the Jews observing these three mitzvot the Greeks felt somehow threatened; they felt that eliminating observance of these mitzvot would bring the Jews into line with their philosophy and life view. Now we can easily enough understand why they declared the brit and Shabbat to be outside the realm of Greek friendly activities. The brit changes the natural appearance of a man –the way nature created him, it could even be considered a mutilation, yet the Jews took pride in the brit and used it to set themselves apart from the other nations of the world. This bothered the Greeks. The Shabbat also was an affront to the ancient Greek society that did not recognize the holiness of the seventh day. They viewed the world as a place of natural development in which there was no particular character invested in one day over that of the other. Even more so, the Jews used the Shabbat observance to set themselves apart from the other nations of the world. It came with an alarmingly regular frequency and the Jews stopped their ‘worldly activities’ in exchange for spiritual ones. In this manner the Jews also showed their superiority over the other nations of the world. Therefore it was simply logical that the Greeks should try to quash any holiday or custom that put the Jewish nation on a level above that of the imperial Greek nation. But what is harder to understand is the problem that the Greeks had with the New Moon. What did the new moon bother the Greeks? Was it that extra sacrifices were offered in the Temple? If the regular sacrifices did not bother the Greeks, certainly the extra one could not be reason for their decree! It certainly could not be the extra few prayers that are said on the New Moon, for if the regular morning, afternoon and evening services did not bother them, why should a few extra prayers be a reason to make a decree? Not only that, but many nations used the moon as a calendar. The moon was a natural occurrence; the Greeks could not be against the moon! Why should they care if we used the moon as a method of fixing the months like other nations? Rather the reason that the Greeks objected to our use of the calendar did not come because of the moon itself, but from the power that the Sanhedrin had in fixing the calendar. The Sanhedrin was the great assembly which was the highest Jewish court in all of Israel. Not only did they declare when the beginning of the new month was, but they could decide that although the new moon appeared on one day they could declare that the new month would not start until the next day! They had the power to decide which day would be the New Moon even though the new moon was a natural occurrence and had appeared on a different day! The Greeks objected to our tradition that the Sanhedrin had authority from G-d to declare when the new moon and new month began; it was not dependent on mere sighting. The Greeks believed in nature; they did not like the Jewish attitude to nature. They did not like the fact that we could (with limited authority) do with nature as we pleased. They believed if the moon appeared on Monday, then Monday should be the beginning of the month. The Sanhedrin could, if they wanted, change it to Tuesday. The Greeks felt that we did not have the power or authority to change nature; we, of course, disagreed. When we light the Chanukah candles we make a blessing, “…who did miracles for our forefathers in this time in those days.” The famed Chassidic rabbi, Levi Yitzhok of Bertichov asked the question why is this blessing recited on Purim and Chanukah, but not on Passover? The miracles of Passover were greater than the miracles of Purim and Chanuka – everyone saw them! G-d changed nature on Passover and it was observable to all, Jew and non-Jew alike. He split the Red Sea and the water stood upright like a brick wall – this is a tremendous change in the nature of water. Instead of water ‘falling down’ like all liquids, it stood upright like stones. The same with all of the miracles in Egypt: the death of all first born Egyptian males, the death of the Egyptian livestock, etc. No Jew was injured, yet the Egyptians suffered and saw clearly that the Jews were spared any harm even if they were standing next to them. Can a miracle be more open than that? Yet on Chanukah, the military victory and then the lighting of the small vial of oil that lasted for eight days, very few witnessed an open miracle – for certain the nations of the world saw the victory as something perhaps unusual, it could happen that a weaker country defeats a stronger country, perhaps they were more motivated but they did not view it as a miracle. The same with Purim, no one saw any miracles then either – it all happened within the covers of nature. This is really the reason for us to make the blessing, “…who did miracles for our forefathers in this time in those days.” The miracles that happened at Passover time in Egypt were not only for the Jews but also for the nations of the world to see and to fear G-d and the new nation of Israel. The miracles of Chanukah and Purim were for us, not for the nations of the world. Therefore the blessing is “…who did miracles for our forefathers in this time in those days.” These miracles are for the Jews to see and notice, but they are not intended for the rest of the world. These miracles are even greater since the desired outcome that G-d desires happens without anyone who is not carefully observing noticing that He is directing the events. Nature remains nature, the world remains the same, but we Jews have realized that G-d’s great power is so great that he can make a miracle without having to change nature. Nature does the bidding of G-d, He does not have to ‘replace’ nature in order for the desired end or goal to come about. This realization on our part that a miracle occurred is a great step forward in the realization of G-d’s manifest attention to all actions in this world. It aids us in realizing that the world is not a place where anything goes; there is an owner, a master and He alone will bring into the world that which He desires to do and it is only incumbent upon us to observe it. Chanukah is a time to sharpen up our skills in seeing the hand of G-d working within the parameters of nature. It is a time to kindle our light that the rest of the world will come to realize that G-d alone is the master of nations. The tiny light of Chanukah must burn brightly into the darkness that the sweet light should be shared by all. * Adapted from the works of the Pri Tzodok, Rabbi Zadok HaCohen who lived about 150 years ago.